In this episode Nicole Domanski: Web designer, Consultant, and Yoga enthusiast shares 3 Things You Must Consider When Designing Your Online Store! After the tip, we go backstage and learn about Nicole’s, Challenge by chance , Giving back through coding , Italian talents and more! My name’s Nicole Domanski. I’m the COO of Envalo, and today I’m going to talk about three things you must consider when designing your online store. The first tip is know who your users are. Find out who are the people that are shopping on your online store. Don’t focus so much on demographics. It’s important to know how old they are, where they’re from, what their gender is, their age, but also know why they’re coming to your store. What are their goals? Do they have any frustrations? Are they shopping at work over lunch? Are they bored? Are they at the grocery store shopping on their phone with kids in their arm? All these things are important to know about your users because it will help us target different promotions at them and how we design and build your website. The second tip is think about your product data. The first time when a manufacturer builds their online store, a lot of times they’re moving away from a printed product catalog, so you’re used to seeing products a certain way. They’re always on paper. They’re laid out individually. It’s important to know your platform so that you can take advantage of it to display your products in the best way possible. For example, let’s say you sell t-shirts. A lot of platforms offer ways to display t-shirts where you can allow the users to pick different options. Instead of displaying one t-shirt that’s white and small on one page and one t-shirt that’s white and medium on another page, what you do is you combine it and you display one t-shirt where you allow the users to pick their size and their color and then add it to cart that way. A disadvantage of showing the same product on multiple pages is that it negatively affects your SEO because that’s actually duplicate content. The third tip is merchandise to your shoppers. Now that you know your users and your product’s in a good place, you can use the platform to your advantage to target promotions at them, and also use different techniques to help them buy. For example, a lot of platforms come with related products and upsells and cross-sells. A related product is when you’re on a product page and you’re shopping for shoes. Related products are shoes that are similar. An upsell on a product page would be fancier shoes that may cost a little bit more. Cross-sells are always in the cart, or usually they are. Cross-sells would be helpful with shoes when … Let’s say you add a pair of shoes into your cart, a cross-sell would be socks because that’s usually something that you buy with shoes. That’s it. Using these three tips will help influence your online shoppers and increase your sales. 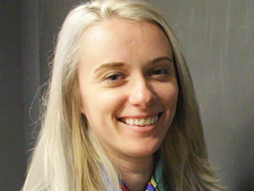 Nicole Domanski is the COO, Lead Designer and a co-owner of Envalo, Inc. There she helps businesses design and implement projects related to selling their products online. She also oversees delivery on client projects to make sure the project is successful and timely.